PADI Speciality Courses are perfect for all divers no matter what skill level, to expand their skills and confidence by working closely with PADI’s trained instructors. The Padi Open Water Certification is the minimum Padi Certification for diving speciality. PADI Specialty Diving Courses teach you new techniques and give you the knowledge to enhance your underwater exploration in the diving speciality of your choice. Scuba diving is a way to explore the underwater world in new and diverse ways. These Padi courses are part of core foundation to build upon your diving career or just for fun. These PADI Speciality Courses improve a diver’s knowledge and experience in various diving speciality courses and as a foundation for further diver education. Speciality programs can be conducted in 1-2 days and can credit towards the Padi Adventures in Diving certification. Also one of best things about PADI Speciality Diver courses is that with each dive you are one step closer to earning your PADI Divemaster or Padi Master Scuba Diver accreditation. 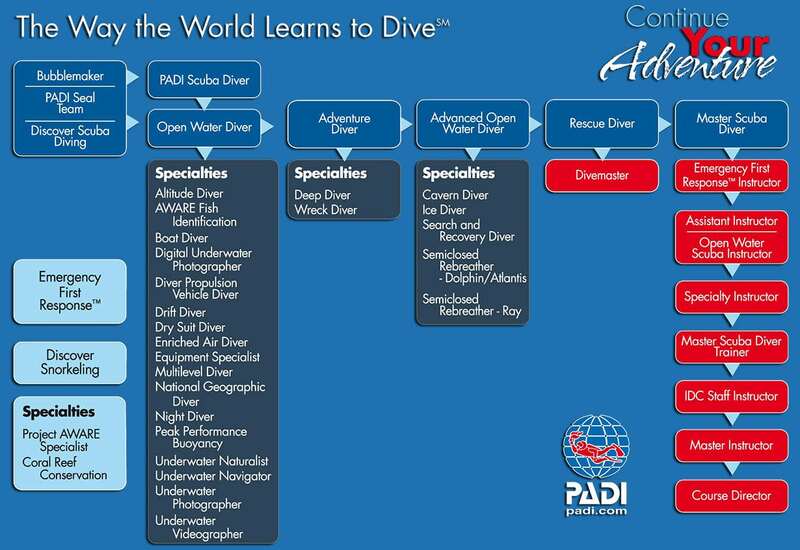 Some Padi Speciality Courses can be online learning –Padi elearning. Come and learn the tricks of the trade and the benefits of diving from boats. Dive Manual theory, followed by 4 Deep Dives. Gain the knowledge and skills to safely dive with and a dry suit. Great local dive sites in a whole new light! Have the perfect buoyancy as diver. You want to have the ultimate buoyancy control. Learn how to identify various range of fishes with this exciting course. Learn dive planning, procedures, techniques and how to deal with potential problems. Learn about our aquatic ecosystems and the inhabitants that you may encounter on your dives. Learn to navigate using natural clues and compass. Finding your way is not a matter of luck! So take the plunge today and reap the benefits that a PADI Speciality Diver course can offer.